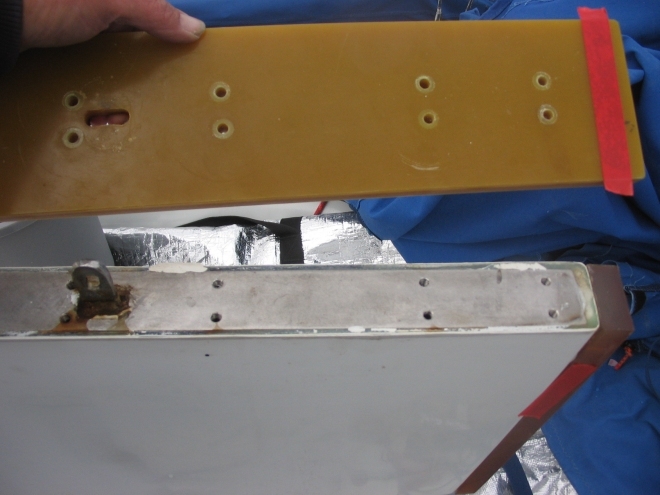 This keel needs 4kg of lead added to bring it up to 327kg. 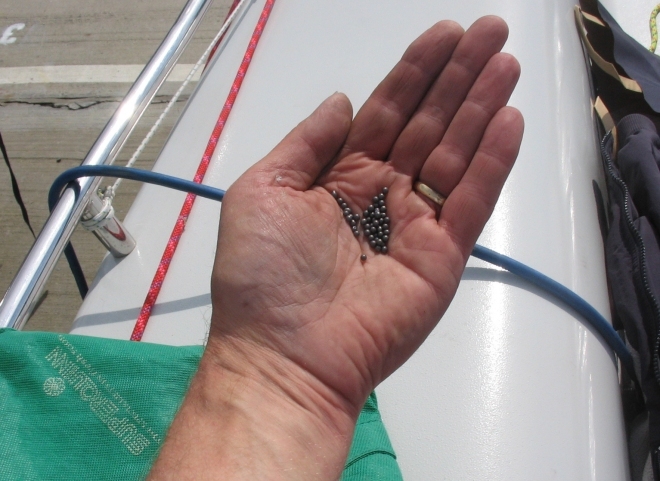 Begin by reading the Laser Performance notice about adding lead to your keel. 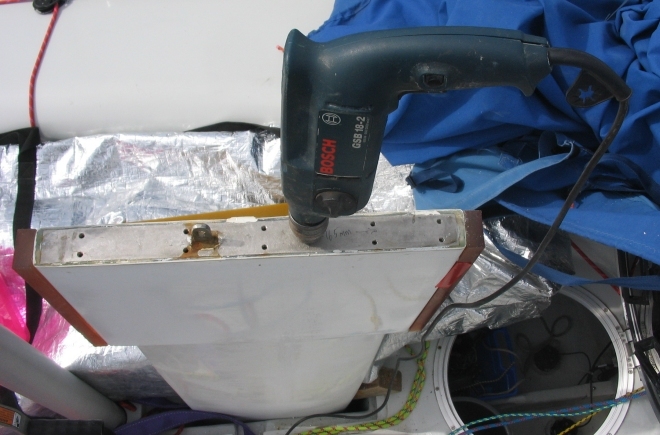 Use a 10mm spanner to undo the 10 bolts that hold the G-10 flange to the top of the fin. Use a sharp knife to cut thru the small amount of sealant beneath the flange. Do not lose the bolts! 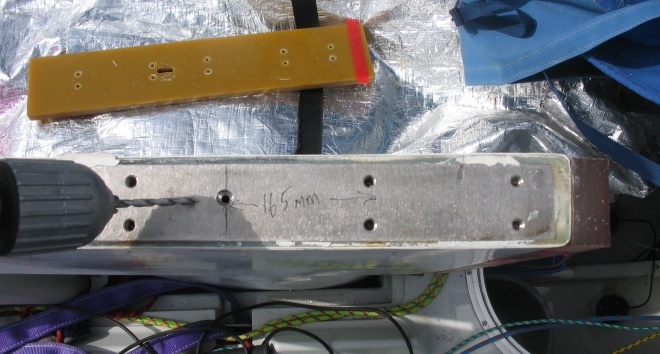 Measure 165mm back from the front of the steel plate on top of the fin, find the centre of the plate and start drilling. 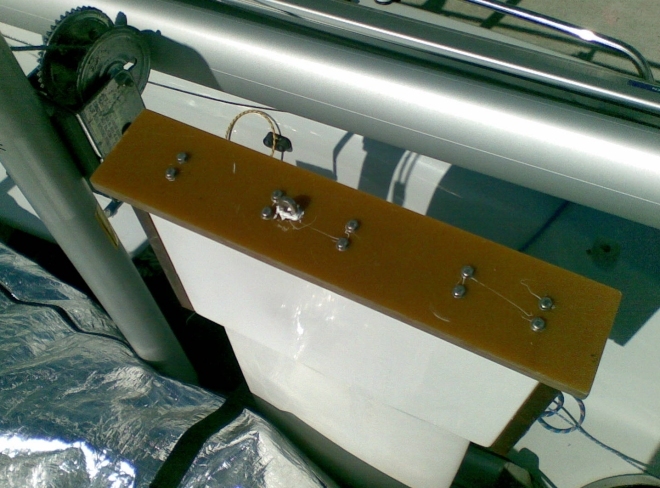 This is the centre of an 80mm x 40mm length of box section steel that runs from the top of the fin (presumably welded to the underside of the steel plate) to the top of the bulb. The plate is 12-14 mm thick, you will need good sharp drill bits. Do not waste your time with blunt bits, it is a hard piece of steel! I used a 4mm bit in the battery drill and an 8mm bit in the mains-powered drill and it took a good 20 minutes to do the job. Learn from my mistake: put tape over the bolt holes to keep bits of swarf from falling into them. The 8mm drill bit has broken through. Lots of metal swarf produced. Sweep it all away from the boat lest it rust in place leaving unsightly red marks on the deck. The things you learn. This is a cordura bag filled with 2 kg of tiny lead shot, like bird shot from a shotgun shell. 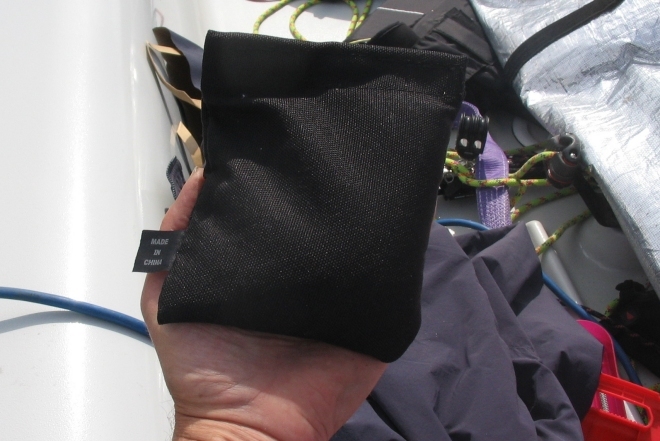 It's like a fancy bean bag, used by divers who want a form fitting weight instead of a lump on a belt. Get it from your local dive shop. This 2kg bag cost Euro 18 and two were needed. Made in China. After slicing an opening in the bag, here is the size of the shot. 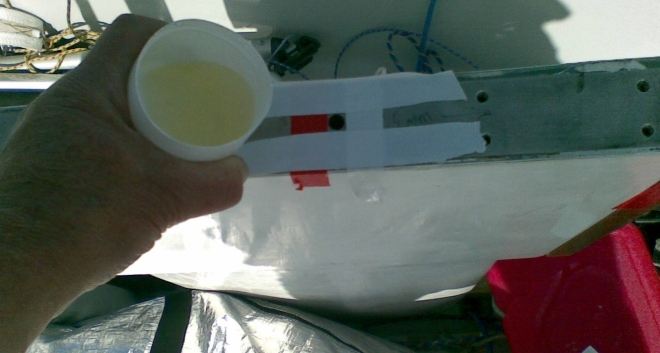 The problem: how to get all of the several thousands of tiny shot down through the 8mm hole in the top of the keel. A bit of lateral thinking. This job was done on the boat at the Royal St George. A rummage through one of the club's rubbish bins produced a length of beer line. Another bin offered up a plastic 7-Up bottle. 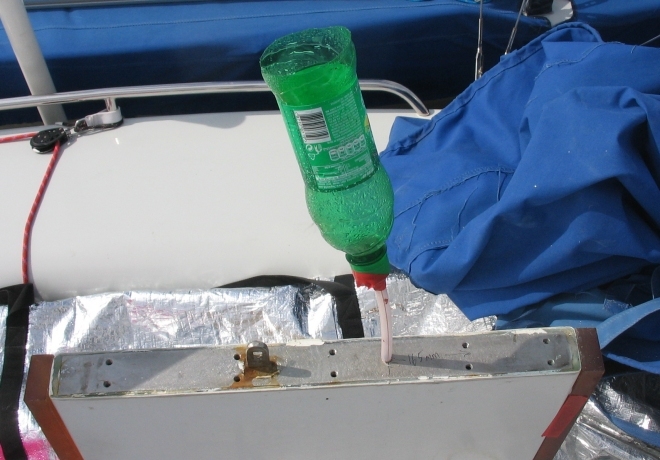 Drill a hole in the bottle cap, tape the beer line to the cap, cut off the bottom of the bottle and hey presto: a funnel. Not enough hands to hold the funnel, pour the lead shot and take a picture, but trust me, it worked! Could hear the shot rattling down the interior steel channel. Pour some epoxy resin down the hole to glue the shot in place, lest they rattle around when heeled. Tape around the drilled hole to catch any excess resin. A bead of Sikaflex 291 was laid down, then the G-10 top replaced, Sika in the bolt holes, tighten the bolts, another bead of Sika around the lifting strap, job done and a-weigh-oh to Crosshaven!